There was no missing the caged, architectural headgear at Brian Lichtenberg's spring '09 show at BOXeight, created by LA graphic designer Franc Fernandez. 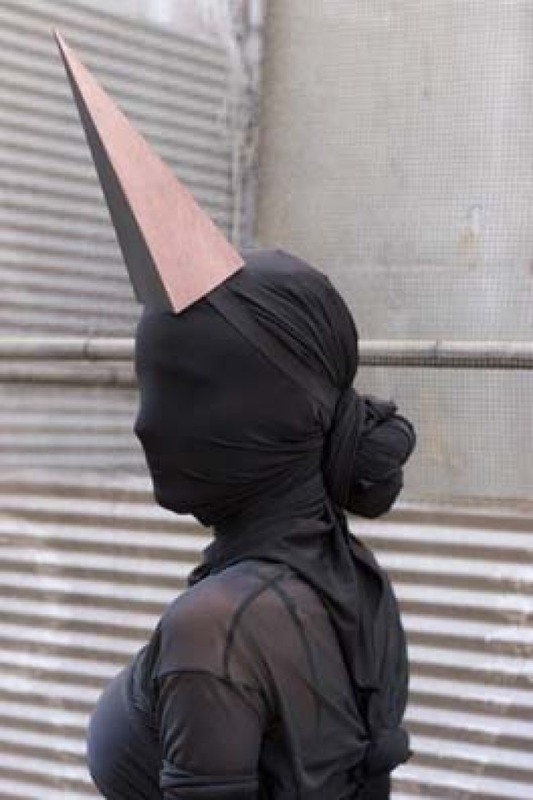 Today, JC Report features Fernandez's latest collection of headpieces, Blanc, in which the designer explains its inception: "The line really started with Grace Jones and Jean-Paul Goude's video for 'Libertango'...She wears a dunce hat in the shape of a tall, sharp pyramid, but it gets taken off in the beginning and you don't really see it. That image has always stuck in my mind." Apparently, Fernandez created pieces to wear to Mustache Mondays parties Downtown, and was subsequently contacted by the New High (M)art to contribute pieces to its latest curated stock of futuristic fashion. Then came Lichtenberg, who commissioned Fernandez for his recent show. Fernandez told the blog: ""No one in LA—or even the US in general—really wears hats any more, and when they do, they aren't as adventurous as they used to be in the late '80s, or today on the London club scene...So I figured, if no one's doing it, why not?"